Available through your local Harley-Davidson dealer, the RR250 was eligible for AMA Class C racing. 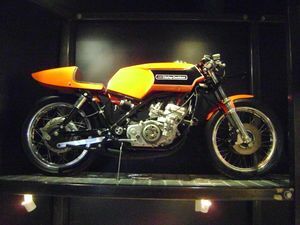 The US versions used Mikuni carburetors, while the European counterparts had Italian Dell'Orto. Ceriani four leading shoe front drum brake was standard equipment, but this machine has the "factory only" twin disc setup. These machines were built by Harley-Davidson's subsidiary Aermacchi. Harley needed a line of small capacity entry level machines to attract younger potential customers into their dealerships, so they purchased this old established company. This page was last edited on 11 August 2010, at 00:57.